Renovated in 2016 our cosy cottage is yours to enjoy for your chosen family holiday. The contemporary decor, comfortable furnishings and log fire make this space ideal for both summer and winter breaks. French doors open up front and back to a sun filled deck and spacious courtyard for dining. Wifi and Sky Tv. 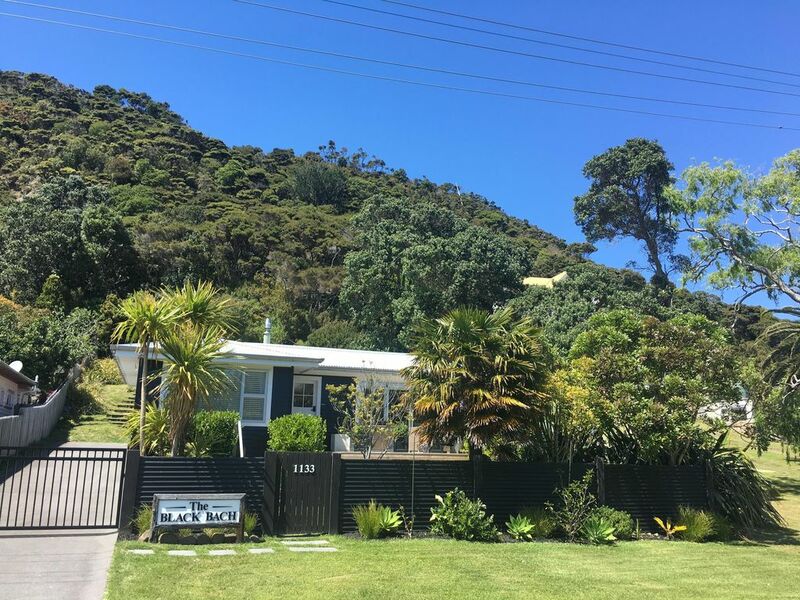 Ideally located 200m to the Whitianga Passenger Ferry for you to explore the many shops, cafes and restaurants. Also close to Front beach & Flaxmill bay for a swim or stroll. A 20 minute drive to Cathredral Cove, Hahei and Hot Water Beach where there is plenty to explore! Great scenic walking tracks nearby. Suitable for families, wedding groups or for a romantic couple get away. Pets allowed with prior approval and there is an additional $30.00 fee for up to a week. Please supply a photo and description of your pet for acceptance. Please note that the back yard of our section is unfenced native bush with rocks. Please supervise your children and animals. Please respect our home and leave it in the same condition you found it. As the cottage is on tank water please conserve your water usage at all times. Im so lucky to live in this gorgeous part of NZ! Its been an amazing wee project getting this bach ready for holiday rentals. My husband and I love the outdoors from boating to running and walking and simply just enjoying the scenery. The location of the bach makes discovering our beautiful area a dream. You get the best of both from here. The Bach is an easy walk to several close beaches and great scenic walks. Feeling like shopping .... stroll down the hill and catch the Whitianga Ferry which is a short 5 minute trip over to the seaside town of Whitianga. Grab all your supplies from here, shop and enjoy! White sandy beaches, scenic walks and a great selection of cafes and restaurants for you to enjoy. If you enjoy the sea why not explore Mercury bay and the surrounding areas! There are several sight seeing boats available and fishing charter boat trips that run daily ... prior bookings are recommended. Open plan to the kitchen and lounge. 5 x dining chairs around dining table and 3 x servers chairs. Outdoor table also for those long lunches and balmy evening meals. Table with 2 x bench seats. Stylish comfortable and spacious Bach in a great location. Everything works and it looks exactly like in the photos. Welcome pack is a thoughtful touch and the coffee machine is a dream to operate. Fantastic Bach, great location - Had a wonderful family Christmas. We will be back! Such a lovely place to stay, very comfortable beds and the house is setup so well with all the needed things. So please you enjoyed your time at our bach and choose our place for your stay. Thank you for leaving it spotless. We welcome you and your friends back anytime. Our only regret is that we didn't have more time here. We can't wait to come back and plan our next holiday around staying here. Thank you! Thank you for being a perfect guest and keeping in touch! Look forward to your next visit. Beautifully appointed Bach with lots of luxurious touches. We had a lovely relaxed weekend here and even the wet weather didn't dampen our stay. It was very nice to be able to bring our pet dog and the fact that the owner was so trusting with such a lovely Bach. The location is perfect .